If router has a packet destination address 192.168.1.255. What describes the operation of the network? The destination IP address 192.168.1.255 is broadcast address of the network 192168.1.0 /24 on router R1. Since router (R1) received a packet with destination IP address (192.168.1.255) which is broadcast address so it simply discards the packet as Forwarding broadcast packet can lead to severe storms of packets, and if uncontrolled could lead to network overload. Users on the 192.168.1.0 /24 network must access files located on the server 1. What route could be configured on router R1 for the file requests to reach the server ? To enable users on 192.168.1.0 network to access files on server1, we need to establish a default static route. When a packet is sent from Host1 to Server1,in how many different frames will the packet be encapsulated as it is sent across the internetwork? First: Host1 encapsulates the packet into frames and forwards to the switch. Switch in turn forwards the same frame to router R1. Second: Router R1 receives the frame on one interface and it is encapsulates into new packet once it leaves the router R1 towards the direction of server1. Third: R2 receives this packet and it also encapsulates the frame into new packet when it is forwarded to server1 on different interface of R2. Therefore the packet is sent using three different frames to reach from Host1 to server1. What must be configured on the network in order for users on the internet to view web pages located on web server2? On router R1, configure a NAT to translate address on 209.165.100.0 to 192.168.1.0 network. The router address 192.168.1.250 is the default gateway for both web server2 and host 1. What is the correct subnet mask for this network? Given subnet mask for this network is 255.255.255.0 based on the exhibit. To find the correct subnet mask for this network based on number of devices shown in the exhibit that are already configured with IP address and by not wasting IP addresses scheme. The network 192.168.1.0 consists of only three devices as per the exhibits which are configured with IP address. so in 4th octate the first 2 bits should be used for subnet (this will give us max of 4 subnets).. remaining 6 can be used for hosts in each subnet. What is the correct subnet mask for THIS network. i guess answer of Q 4 is NAT is required. you cant access the server from internet with routing because server is placed on private IP address so its impossible to access it from internet. so i think answer is option "C"
We are creating a static route using point-to-point link from R1 router to R2 router(Internet). Once traffic reaches R1 from R2 since server Network is directly connected to R1 we can reach server without any NAT statements. a3tips, i still dont agree with u.
just aswer me can u access private ip from internet without nat? 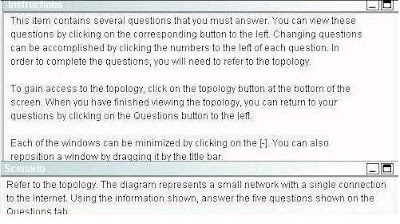 "We are creating a static route using point-to-point link from R1 router to R2 router(Internet)"
but in answer choices a,b,c,d there is no such option to configure static route on R1. As per exhibit we have direct connection using a serial link (point-to-point) between R1 and R2. So by adding a default static route on R2 to server network we can access the web page. we all know we need a NAT statement to access private network from internet. Here we are answering the questions based on topology provided. i am also talking in term of this topology.but for topology we can not change our concepts either. But just check latest P4S 245 Q , they have also corrected this , and answer is NAT, thats right now. Oks u tell me if we select NAT Answer option C then wont it work? Moreover i agree with you that with static route it will work, But with this answer we are saying that private IP is accessible from public network with routing, and that is false. You have a point... I will update the answer to NAT. I am not supporting P4S answers if i was then other Qs would also been wrong right..
U r doing a great job. The third one is R2 recives the frame on one interface from R1 and this packet then need to be sent to other interface of R2 to reach the server here again the frame encapsulation is done before leaving to server. I took my CCNA today and passed it. This was one of the labs that appeared on the test. Thank you for maintaining this wonderful blog. About Question 1, I guess since the Ip directed-broadcast command is disabled by default this packet would indeed be dropped. However this could be forwarded if that was enabled. Just a note to the community..